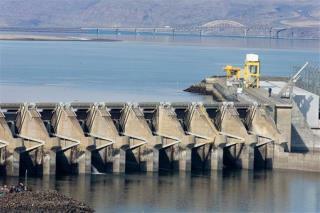 Wanapum Dam now a "non-failure emergency"
(Newser) – Crisis at least temporarily averted: A massive crack in a dam on Washington state's Columbia River has been downgraded to a "non-failure emergency" after it apparently fixed itself. After divers discovered the 65-foot-long by 2-inch-wide crack last week, officials warned the dam could fail and lowered water levels about three feet a day down to 26 feet, which caused the county to go under a flash flood watch. But the solution worked as planned, reducing pressure on the dam, which allowed the crack to close, NBC News reports. A public utility rep says the spillway on which it was found is now stable, though a permanent repair is still needed. Cracks don't just "seal themselves," ever. Anybody with experience at USING a toilet knows that. Its "fixed" until the next big rain, at which point the dam will probably fail, after soaking the ground and making the rescuers tasks even more difficult.